Were it not for Nickie Quaid's jaw-dropping flick to deny Cork's Seamus Harnedy a certain goal in the dying seconds of their All-Ireland semi-final clash, no one would be talking about Limerick as 2018 All-Ireland champions.It was so good that US magazine Sports Illustrated named it their moment of that sporting weekend. On the ropes, ready to be counted out, the footballers of Kerry were just a minute away from an ignominious championship exit at the hands of Monaghan in Clones when the combination of Kieran Donaghy and David Clifford conjured a late equalising goal that felt like a passing of a torch. It’s fashionable in hurling to draw over-heated comparisons between the gods of today and long-gone deities of the game like Ring and Mackey and Rackard. A futile exercise, of course. Yet, on August 19 in Croke Park, Clare’s Peter Duggan summoned a moment of such outrageous brio that context and time ceased to matter. “How did he do that?” gasped a breathless Ger Canning on RTE TV commentary. A question, to this day, without an answer. Back to back FAI Cup Final defeats at the hands of Cork City had stung Dundalk. And the fans that descended on the Aviva for this year’s decider expected another tight contest; the previous three finals had all gone to extra time and the 2018 renewal appeared to be going the same way. But that script would alter this year with 17 minutes remaining. For Sanita Puspure, finally winning gold in the single sculls at the World Championships in Bulgaria represented more than just the medal that she clutched so close to her heart. It represented a journey through so much troubled waters in a career where her talent promised so much, but delivery was stymied by cruel misfortune and mischievous fate. Rhys has been vaulting obstacles since he learned how to walk. 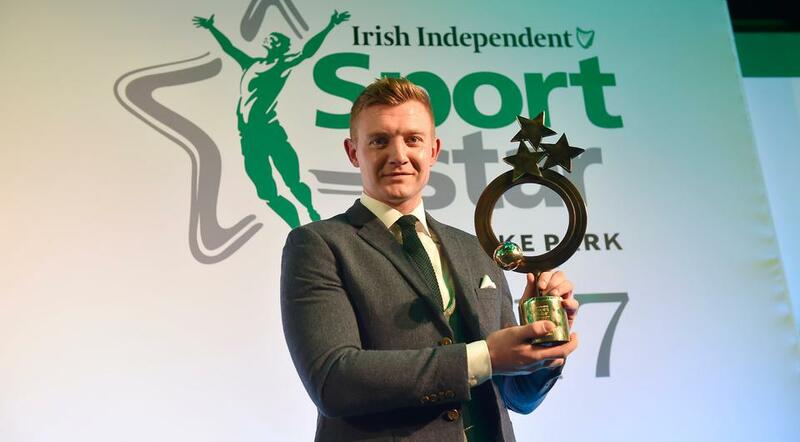 Whether it was mounting the furniture as a toddler in his front room, or climbing trees in the garden as he got older, his life has always been about taking flight and this summer he soared higher than ever before when he became Ireland’s first European gymnastics champion by winning gold on Pommel-Horse. Sometimes in sport, time stands still. It took just four seconds for Johnny Sexton’s high, hanging drop-goal to make it from his boot over the French bar but in the Stade de France it seemed to take an eternity. The out-half was the first to react, wheeling away in jublilation and his team-mates soon followed as they celebrated wildly after snatching precious victory from the jaws of defeat. “Pinder, Pinder, Pinderrrr” – probably one of George Hamilton’s first games on hockey duty produced the sport its own “a nation holds it breath” moment as Ireland overcame Spain in their Women’s World Cup semi-final.Ayeisha McFerran – likely a shoo-in for world goalkeeper of the year – kept Ireland just about in the mix with four saves, brilliantly picking off Gigi Oliva and then Gillian Pinder stepped forward to hit the winner. A heart-stopping hurling championship lit up the summer as Limerick upset the odds to end their 45-year wait for Liam MacCarthy with a last-gasp defeat of Galway. Few would have predicted a Treaty victory but John Kiely's youthful side took all before them with their own unique style to lay to rest the demons of previous final defeats for the county. There was no stopping the Dubs as Jim Gavin's men moved one step closer to footballing immortality when completing a famous All-Ireland four in a row. Few were able to lay a glove on the all-conquering Dubs who breezed through the 'Super 8s' and proved their superiority once again this year with League, Leinster and All-Ireland glory. In 2016 it had been agonisingly close, five hundredths of a second separating Thomas Barr from an Olympic bronze medal, his fourth-place finish in the 400m hurdles nonetheless greeted with typical sunny-side-up disposition. In Rio the Waterford athlete had become the first Irish sprinter to make an Olympic final in 84 year, but, as good as that was a hole remained, a great big void in his career that still lacked major championship hardware. On an August night at Berlin’s Olympic Stadium, Barr finally broke through. Never in the 84-year history of the European Championships had an Irishman won a sprint medal, but Barr again dismissed the weight of the past with his finest performance of the year. It took all of 48.31 seconds for him to sprint on to the podium, his brilliant bronze medal behind two of the world’s best offering our sports-mad nation another magical lift, all the while elevating his career into even more rarefied air. What a year it was for Davy Russell as he became a three-time Irish champion jockey and top rider at the Cheltenham Festival for the first time but the cherry on the cake came at Aintree on April 14. Bidding for his first English Grand National success aboard Gordon Elliott's Tiger Roll, 38-year-old Russell exuded confidence the whole way around on the diminutive eight-year-old. Many doubted whether the three-time Cheltenham Festival winner would take to the National fences but Russell switched the 10/1 chance off throughout the stamina-sapping 4m2½f Liverpool showpiece and went on to just get the better of Pleasant Company in a photo-finish.